These gorgeously remodeled beach casitas are the perfect getaway! Included with your stay: Complimentary Bicycles, Beach chairs, Beach-Towels, Free-rides around Siesta and a 7-day week office for your convenience and guest needs. The décor is beautifully done and inspired by the soft tones of the seashore and beach. The owner has spared absolutely no expense in remodeling and furnishing the home! Everything is brand new and boasts only the best quality. As you might expect, our Bianco Sands properties are truly a decorator’s dream offering bright and sunny decor enhanced with coastal colors and white trim. Sleeping accommodations range from 2 to 7 guests. The spotless bathrooms, feature all new cabinets, fixtures, toilets and tub/shower combinations. Brand new soft plush couches and flat panel, wall-mounted TV’s abound everywhere (all bedrooms and living areas) make visiting Bianco Sands such a joy for your guests. Fine linens, towels and everything else are truly “first class” here. Bianco Sands also offers property-wide wi-fi access as well as BBQ grills. Outside seating is available and you can enjoy immediate access to the heated pool. As you sit by the pool in the warm sun relaxing, you’ll struggle with the decision take the very short 1-minute walk to the USA’s number 1 beach or perhaps to Crescent Village for shopping and entertainment. Lots of great places within walking or biking distance. We provide the bicycles and beach equipment. 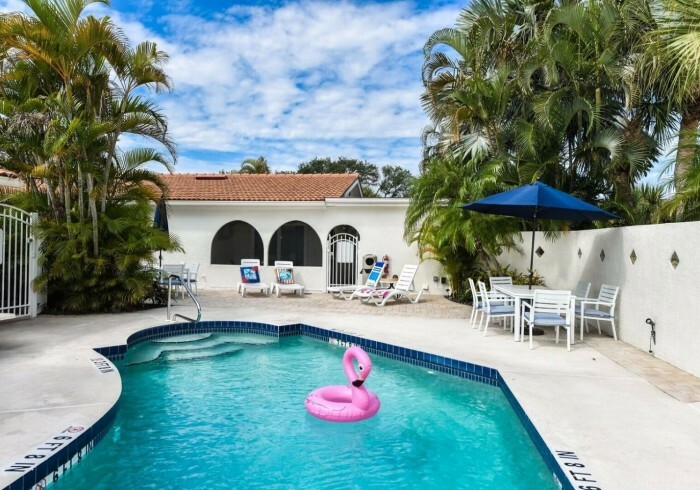 The lush tropical landscaping immediately reminds you of your attraction to Siesta Key Beach, our tropical paradise.